The Imperial Travelling Palace at the Hoo kew shan. Home » The Imperial Travelling Palace at the Hoo kew shan. The Imperial Travelling Palace at the Hoo kew shan, Henan Province. Jupiter descended occasionally from Olympus, and became the guest of mortals, and the king of Tartarus emerged from his gloomy hall to visit the palace of Queen Ceres, yet the mighty autocrat of the “Celestial empire” never deigns to enter any save an imperial habitation. No private palace of his humiliated mandarins’ no public inn of his enslaved subjects, is ever honoured by the imperial presence; when the court makes a tour of pleasure or policy, the retinue is lodged at “travelling palaces” erected for their reception. These occur along the great high-roads that connect the principal cities of the empire, and some of them exceed in sumptuousness, all in picturesque accompani’ ments, the much-celebrated palace and gardens of Peking. Keang-su is a fair and a fertile province, enjoying variety of seasons, of soil, of scenery, “here we find the country growing more beautiful, better cultivated, and in all respects more interesting; we are soon surrounded by picturesque hills in the distance, and the people display superior riches and prosperity in their dresses and habitations.” In the midst of these happy faces, and amongst these sunny hills, is the imperial travelling palace of the Hoo-kew-shan or Tiger Mound. The locality is about nine ie northwest of Soo-chow-foo, the second city of the first rank in the province, and is one of the most famed in Chinese story, for its romantic scenery, its commanding prospects, and its ancient legends. 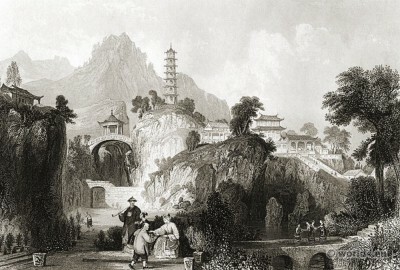 From the conspicuousness of the mound that rises so precipitously from the level country, and which has now become a valuable landmark to the mariner, this ” gathering of rocky eminences “is also known as the Hae-yung-fung, “or sea-rising peak,” Every summit of this “many-topped” group, every recess within these mountains bosoms, every ravine that intercepts their continuity, presents some object of curiosity or admiration, in the production of which art and nature contend for superiority. On the highest pinnacle is the Keen-che, or “Sword Pool;” beside it the Tseen-jin-tso-shib, or “rock to seat the thousand people,” and opposite are the Sang-kung and Shwo-fa terraces. On this spot, as legends say, Heu-loo, King of Woo, was buried, with all the ceremony that suited his rank, and on the third day after his entombment a white tiger was seen seated on his monument, where it remained for several days, and to which it paid periodical visits for many subsequent years. It is also believed that when Che-hwang of the Tsin dynasty, and first universal monarch of China, meditated destroying the tombs of Woo, the white tiger, the genius of the family, appeared to him on the mound that is named after his species, and deterred him from his purpose. Its sanctity and historical associations, in addition to the attractions of its natural beauties, led hither two brothers, Wang-seun and Wang-min, officers of the court of Tsin, who built their country-seats amidst the rocky defiles of the mountain. The list of temples on the Tiger Mound includes the Twan-poo, in which sacrifices were offered; the Yin-ho-tsing where Tung-chang studied, and in which a tablet is suspended wherein he is described as “the thrice-reverencing Tse;” the Woo-heen, or Temple of Five Worthies, adjoining the preceding, is dedicated to three celebrated characters of the epoch of the Tang, and two of the Sung dynasty. Antique relics of various descriptions lend an interest to this remarkable locality, perhaps the ruins of the Ko-chung-ting or “Middle Hall,” and Pih-kung’s Dyke, so called from Pih-loo-teen by whom it was constructed, are held in greatest veneration by Chinese antiquaries. There is a story that Sang-kung, a celebrated Bhuddist priest, was engaged in expounding the mysteries of his faith on the Tiger Mound, when the Emperor Wan-te, of the Sung dynasty, arrived there, and interrupted his prelections by inviting some of his disciples to a banquet. To the emperor’s request that his guests would partake of the cheer, one, more courageous than the rest, replied, that “the rules of the priesthood forbade its votaries to taste of food after the day had passed its middled “How,” said the Emperor, “can the commencement be in the middle (ko-chung)?” “When it is day and dawn of day,” answered Sang-kung, “Heaven is said ‘ to middle if,’ and how can it be otherwise” The priest was silent, then raising his chopsticks, proceeded to taste the delicacies that were spread before him, after which, in comme moration of the circumstance, he bestowed upon the pavilion the name it bears to the present day. In after ages this revered asylum was the solitary abode of Cho-taou-sang, another Bhuddist priest, renowned for sanctity and learning. Having in vain solicited the attention of men, and finding them a perverse generation ” totally destitute of reflection,” he collected a number of large stones, and placed them upright all around his rude mountain-pulpit; then seating himself amidst these chill emblems of the human heart, he sarcastically proceeded in his exposition of the Shwo-fa faith, upon which his silent auditory are said to have bowed assent, and in that approving posture they still continue upon the scene of the event. The summit of the bold rock that rises abruptly, behind the imperial buildings, and is connected with the opposite cliffs by an arched viaduct spanning a deep ravine, is surmounted by the beautiful Han-meaou pagoda of seven stories. From this graceful structure, formerly attached to the Ho-tsing temple, the prospect is extensive and delightful, forming, from the earliest periods of native topography, a subject of the most enthusiastic admiration. The hills of the Hoo-kew are marked by deep ravines, down which streams of transparent are heard eternally falling, and, on the narrow pathways, that follow their winding course along the lowest depths of the dark chasms, the rays of the sun scarcely ever strike. Nothing can be imagined more tranquil, lonely, and inspiring than the lofty site of the temple itself, “where the blue ether is breathed, and the white clouds pierced to reach the arch of Heaver Below, in the wide-extended plain, is the populous Koo-soo, and from this sublime may ” in a turn of the hand” behold the south. In the centre of the accompanying view may be observed an upright stone inscribed with the words “How-kew,” the name of the place; its presence affords another analogy between oriental customs and those of these western Isles. There are still in North Wales many such “upright stones,” some perhaps, like the Roman Termini, to mark territorial boundaries; one called Maen y Campiau, ” the Stone of Games,” the goal, perchance, of some primitive stadium; while another, perpetuating a station of pilgrimage or penance, is still designated Maen Achwynffan, the Stone of Lamentation.” This assemblage of ancient remains, this group of picturesque hills, rendered interesting by so many associations, is now included within the grounds and the gardens of an imperial palace, and is no more likely to revert to the dominion of priestcraft. Gallery: China, in a series of views, displaying the scenery, architecture, and social habits, of that ancient empire. Drawn, from original and authentic sketches, by Thomas Allom. With historical and descriptive notices by the Rev. G. N. Wright. This entry was posted in 18th Century, Asia, China, Genre and tagged Architecture, China scenery, Landscape on 1/30/15 by world4.